Offering Bathroom electric hand dryers. Most public bathrooms have hand dryers for there customers. Designed to cut out paper towel waste and cut costs.We carry alpine dryers, AJ Washrooms dryers and American Specialties hand dryers. Most hand dryers ship in 48 hours from the factorys. Throughout the years there has been more interest to installing electric hand dryers when designing restrooms. The appeal comes from smaller foot prints, minimizing waste, and the ability to make restrooms more sanitary. Hand Dryers offer many features that can be appealing when laying out a restroom. One option is when trying to match or incorporate colors into a restroom. A majority of the options are often Stainless Steel or White, but there some manufacturers that are offering colored hand dryers to make restrooms more color matching and welcoming. Whether you need to add a little color with red or bronze or try to have a cohesive flow through a restroom with stainless steel, white or black, there are many options available. Hand Dryers often offer users options such as hardwiring the unit direct or plug in, different voltages and also touch or touch-less models. It is important to consider the traffic flow through the restroom when deciding on which hand dryer to utilize. 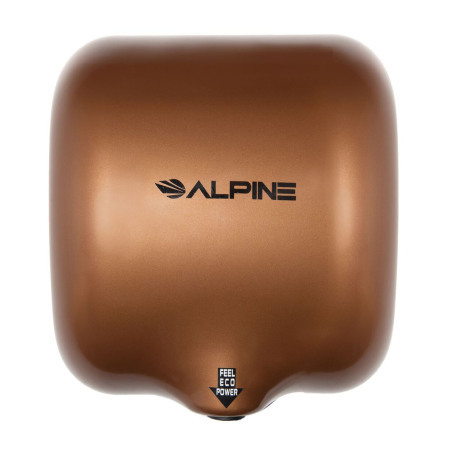 Alpine Corporation supplies many products for public restrooms one of which being Hand Dryers. 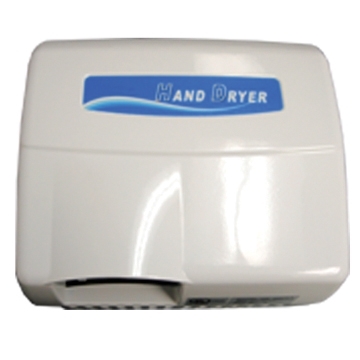 The Hemlock Hand Dryer offers consumers many variances that make this product very appealing. This unit is available in 2 different volts, 110 and 220. With the 110v unit, there are 7 colors that customers can choose from and 2 colors for the 220v. With a 25000 RPM motor, it makes an ideal unit for restrooms with high traffic. All units come with the capabilities for being hardware or plug in for quick easy installation. Additional features such as 10 second dry time, visual blue light hand indicator for hand placement and on/off heating options for user comfort. An auto-stop function is triggered if hands are left under unit for longer than 63 seconds. Alpine offers a 5 year limited warranty for this product. American Specialties offers many products for public restroom including Hand Dryers. With numerous models offered, 0197 and 0198 are two popular choices. Both models come in 3 colors, bright stainless steel, satin stainless steel and white and are available in 120v or 240v. There units would have to be hardwired into the electrical. Additional features include 60 second automatic shut off, quick dry time, and are fabricated of heavy duty, one piece steel or stainless steel. With a smaller compact size, no touch operation and sleek design; these are a great option for public restrooms. AJ Washroom offers a hand full of models in their Jet Air Hand Dryer line. Two of the most commonly purchased units are the U1521EA and U1525EA. Both models such features as surface or recessed mounting, hands free electric sensor, hardwired and also have a 5 year warranty. The U1511EA unit come in a White, baked enamel (powder coated) finish with 2 voltage setup at 120v and 230v. With the U1521EA unit, it comes in a Satin Steel finish with voltages for 120v and 230v. 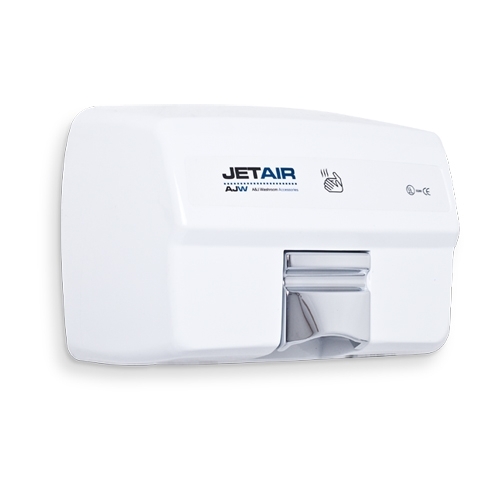 Jet Air Hand Dryers are a great option for commercial restrooms with more models available. Palmer Fixtures provides a full line of restroom accessories including Hand Dryers. Two of the most popular models are the HD0903 and HD0907. These two models are more of the traditional hand dryer side. The HD0903 model is made of High Grade ABS Plastic that is Fire Retardant. It has a approximate hand drying time of about 30-40 seconds, adjustable distance sensor and is completely touch free with auto on/off. With the HD0907 unit, it offers similar features except this model is constructed from cast aluminum. Both models come with a One Year Warranty. 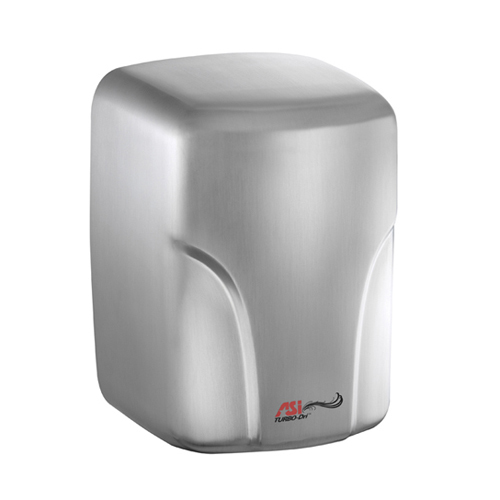 Please contact us with any questions you might have about these or palmer hand dryer models.